Malignant peripheral nerve sheath tumors (MPNSTs) are highly aggressive soft tissue sarcomas that rarely occur in the general population but have a lifetime incidence of 8% to 13% in those with neurofibromatosis type 1 (NF1). Complete surgical resection is the standard treatment for MPNSTs. Unresectable MPNSTs carry a poor prognosis, and survival appears to be worse in NF1-associated tumors than in sporadic tumors. 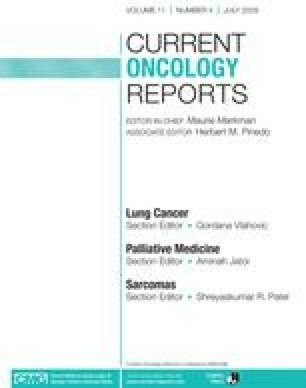 The response rate of MPNSTs to standard chemotherapeutic agents used to treat pediatric and adult soft tissue sarcomas is unknown and is currently undergoing evaluation in a multi-institutional clinical trial. With an increasing understanding of the molecular pathogenesis of MPNSTs, clinical trials with targeted agents have become available and have established that histology-specific trials in this rare malignancy are feasible. This knowledge, coupled with the availability of preclinical MPNST models, likely will accelerate the development of effective treatments for this malignancy.